From the tiniest sea slug to a walloping whale shark, our teachers have so many favorite sea creatures. But our obsession with marine inhabitants is not limited to the slimy and scaly. We're also extremely passionate about our warm-blooded, feathered friends — birds! When we think about birds, we often imagine a radiant cardinal perched in an old oak tree, or perhaps the buzzy song of a warbler comes to mind. 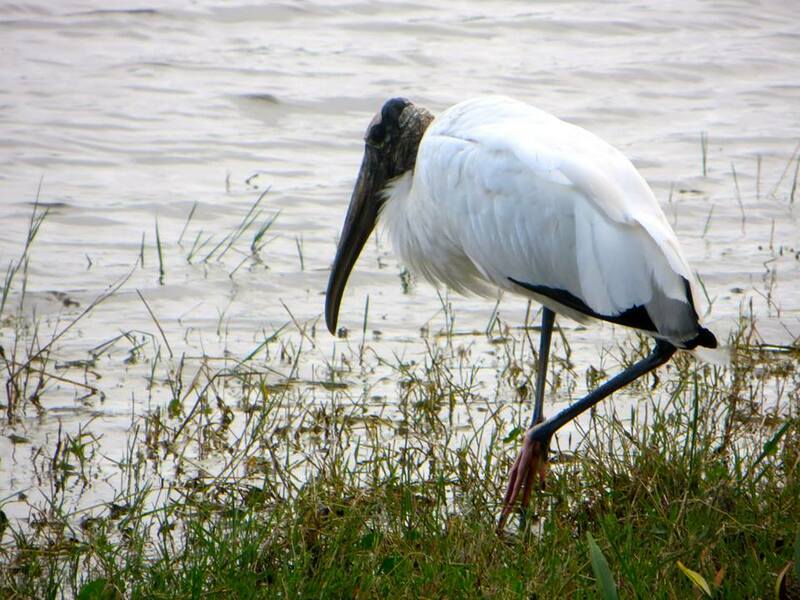 But in Southwest Florida, many birds are a vital link in the marine ecosystem. Great Egrets nest and raise their young in the mangroves, Ospreys pluck fish out of the ocean, and Snowy Plovers comb the Gulf beaches for tiny crustaceans. It’s really amazing to see how birds bridge land and sea, and it's something our educators love to explore. Imagine yourself enjoying a stroll down one of Sanibel’s beautiful beaches, taking in the fresh air and soaking up the sun, when all of a sudden you feel something squishy between your toes. When you look down and realize that a lumpy, brown blob is squeezing through your toes, your first reaction may be utter disgust. After taking a closer look at the wrack line, you realize that there is not just one of these strange blobs – the whole beach is littered with them! The wrack line inundated in sea squirts - a common sight on Sanibel lately. The brown, wrinkly blobs in question are actually sea squirts, referred to as tunicates in the marine biology world. Tunicates are animals that house their tiny body in a thick covering that resembles a tunic – that’s how they get their name. Individuals have the ability to form dense colonies, which often end up looking like the irregular blobs we are now familiar with. These animals attach to docks, mangrove roots, and live shells, and spend their days filter-feeding plankton. The species you may have encountered recently (if you're on Sanibel) is the sandy-skinned tunicate (Molgula occidentalis), which is often covered in sand and bits of shell. Up close and personal with Molgula occidentalis - the sandy-skinned tunicate. It’s hard to believe that tunicates are animals, but they are fully equipped with siphons for feeding, a stomach, and even a small brain. What is really interesting to us is that tunicates are closely related to vertebrates because they begin their life with a notochord, a row of specialized cells found in all animals with a backbone. But unlike vertebrates, the tunicate’s notochord disintegrates as it matures into an adult. When the tunicates wash ashore, they often die off shortly after being stranded on the beach. Last month, Sanibel Island was getting high winds from the North and West, which resulted in the tunicates becoming dislodged from the substrate and pushed up on our beaches en masse. Even though these creatures are quite unsightly, they aren’t harmful – they might just squirt out a little water if you handle them, which we encourage! More windy weather this week deposited a fresh batch of tunicates near the lighthouse. When it comes to jellies, sometimes we feel their presence before we actually see them. While this may be a bit unnerving to humans, these fascinating creatures have been drifting in the seas for over 500 million years and are an important link in the marine food chain. Many sea jellies pack a powerful sting, so it is important to know the difference between the harmful and the not so harmful. Moon jellies are easily recognizable by the 4 petal-like reproductive organs that can be seen through their bell. Moon jellies are the most common species found around Sanibel. Like all jellies, this species isn’t an excellent swimmer but is able to pulse its sac-like body called the bell, through the water. Moon jellies have short tentacles along the outer margins of the bell that are packed with nematocycts, or stinging cells. Jellies use these cells to aid in capturing prey and for the moon jelly, is zooplankton. Not to worry though, their stinging cells aren’t strong enough to penetrate human skin and will only cause a very mild irritation. These graceful jellies mostly consume zooplankton but their powerful nematocysts allow them to consume larger prey, such as minnows and small crustaceans.Their sting can also produce a moderate irritation in humans. Sea nettles possess several long tentacles and long, trailing oral arms. What's interesting about these jellies is that their colors vary depending on salinity levels and therefore may appear transparant or white when found in brackish waters on the bayside of Sanibel. When found in the saltier waters of the Gulf, red and brown streaks radiate from the center of the bell. The cannonball jelly has tiny "warts" located on its bell that are packed with stinging cells. Also known as the cabbage head jellyfish, it’s easy to guess where these jellies get their name. When floating, cannonball jellies take on a spherical shape with multiple, stubby oral arms peaking from underneath the red-fringed bell. Cannonball jellies play an important role in the marine ecosystem because they are the preferred prey for the endangered leatherback sea turtle. In addition to being a food source, they also form symbiotic relationships with fish and juvenile longnose spider crabs. Drymonematidae is the name of the recently added family of jellies and thanks to the pink meanie, it is the first new family of jellies since 1921. A newly described jelly, the pink meanie, was initially observed about 15 years ago in the Gulf of Mexico during a massive moon jelly bloom. When scientists took a closer look, they noticed that this jelly was feeding on the moon jellies and that it was drastically different than anything that had seen previously. It was so distinct, that they created a new family just to classify it! These pink meanies were collected for study near Dauphin Island, Alabama but are extremely rare elsewhere. While they may not be seen commonly in the waters near Sanibel, you never know what could drift along the currents and surprise us all! Comb jellies have a simple, gelatinous body much like true jellies but they aren't in the phylum Cnidaria. Instead, they are classified as Ctenophores because they lack specialized stinging cells. These jellyfish look-alikes are not taxonomically related to jellies but we think these creatures are too interesting not to share! Their beautiful ovoid bodies are lined with thousands of tiny hair-like structures called cilia that they use to propel themselves through the water, often illuminating with bioluminescence. Even though these jellies may look similar to jellyfish, they have a major difference that is perhaps in our favor – they don’t sting! That’s right, these gentle jellies do not have nematocysts. Instead of using a powerful sting to capture their prey, they use colloblasts, which are sticky cells that essentially glue their prey to their tentacles. So, have no fear in handling one of these delicate creatures! Now that the excitement of summer camp is over, we think it's time to reinstate Fun Fish Fridays. This week we are going to learn about a very unique fish that doesn’t look much like its cousins – the seahorse. That’s right, the seahorse is actually a highly modified fish in the class Actinopterygii, or ray-finned fishes. The seahorse belongs to the genus Hippocampus, which literally translates from Ancient Greek to “horse” (hippos) and “sea monster” (kampos). This horse-like fish is prevalent in the waters around Sanibel and Captiva; we actually have 3 species that inhabit the region: the dwarf seahorse, lined seahorse, and longsnout seahorse. The dwarf seahorse (Hippocampus zosterae) is common in the seagrass beds in Florida and throughout the Caribbean. Let’s start with the basics. Seahorses have the same basic fins as most other fish: a dorsal fin and paired pectoral fins. However, instead of a caudal fin (tail fin) the seahorse has an elongated, prehensile tail that it uses for stabilizing itself in the ocean currents. It wraps its tail around seagrass or coral and hangs on tight, helping it save energy for other uses. We've even observed a seahorse catching a ride on an arrow crab's back! Notice the curved prehensile tail of this lined seahorse (Hippocampus erectus). This species can grow up to be almost 6 inches! Like many other fish, seahorses are voracious, carnivorous predators, but because they have no true stomachs, they have to constantly eat to meet their energy requirements. Some seahorses may consume up to 3,000 brine shrimp in one day! To chow down on so many crustaceans, they have a specialized mouth. Their jaw is fused, creating a straw-like shape that enables them to ambush and quickly slurp up their prey. One of the seahorse's favorite meals, the brine shrimp, is an aquatic crustacean that is only slightly related to true shrimp. What’s washing up in the wrack? The ever-changing wrack line can be a very dynamic environment. Originating from the Middle Dutch word “wrak”, meaning something damaged, this place may look damaged but is far from it! Technically, the wrack line is the place on the beach where marine debris is washed up and left behind by the most recent high tide. The wrack line may be teeming with life, full of stinky algae, or a treasure trove of seashells – it just depends on the day! 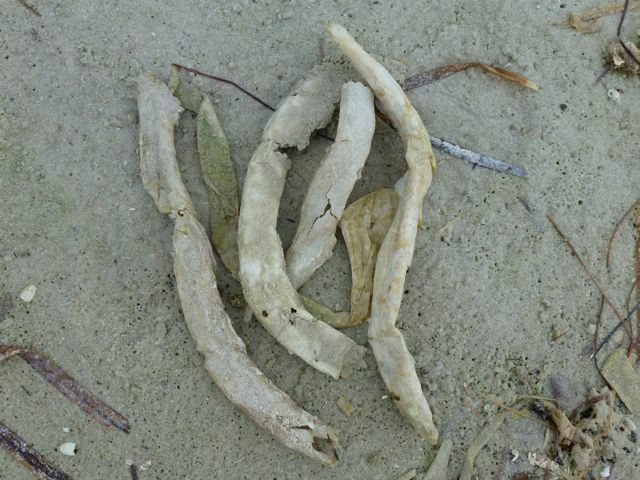 Today, let's explore some of the more curious items we often find in Sanibel's wrack line. Is it a plant? An animal? A fungus? This mysterious blob is actually a colony of animals called tunicates. These teeny-tiny animals protect themselves with a sac made of cellulose and spend their days filter-feeding. Sea pork can be found in various colony sizes and be colored pink, purple, black, and even orange. Purple variation of sea pork. Like sea pork, these paper-thin structures can come in all different shapes and sizes. Gastropods (live shells including whelks and conchs) are responsible for creating these elaborate structures to house their eggs in until they are ready to hatch as young shells. We often find these washed up on the beach after many of the eggs have hatched, but sometimes if you tear open one of the capsules, you can find some of the tiny shells that didn’t hatch. Give it a try next time you happen upon one at the beach. Lightning whelk egg case entangled in red drift algae. These hollow straw-like structures were once home to a marine polychaete worm that looks somewhat like a centipede. The worms build these housing tubes and attach themselves to various substrates or burrow beneath the sandy sea floor. These creepy tubes also provide a home to a couple different species of commensal crabs. Next time you find one on the beach, tear it open and you might discover these crabs! Sea anemones are cnidarians that often resemble flowering plants, but beware of their beauty – they are armed with capsules of stinging cells called nematocysts for protection. Most of the anemones found around Sanibel don't have potent nematocysts and aren't dangerous to humans, but they do have an additional defense mechanism that makes you wonder if they might be a creature from outer space. When sufficiently irritated, they will release defensive threads called acontia that are neon orange and packed with powerful stinging cells. Here is a sea anemone attached to a gastropod shell. Those vibrant acontia are hard to miss! At first glance, you may think these are human artifacts or remains of a large marine mammal, but they are in fact just pig bones. Unfortunately, these don’t come from a rare species of marine swine but rather, pig parts that are used in crab traps as bait. Crabs are attracted to the pungent aroma of the meat and enter the trap to chow down. After the bones have been picked clean, many of them wash out of the traps and end up on our beaches. Duunnn dunnn... duuuunnnn duun... duuunnnnnnnn dun dun dun dun dun dun dun dun dun dun dunnnnnnnnnnn dunnnn…. Betsy! If you’re a local, you’ve probably heard the news - a great white shark named Betsy “pinged” about 70 miles off the coast of Sanibel last Friday – around 10 PM on the night of April 25th! Betsy is a 12’7” 1400 pound immature female white shark. She was originally tagged off of Cape Cod in August of 2013. Since being tagged almost a year ago, she has traveled out into the Atlantic and then moved down the coast and around the bend of Florida. Betsy has traveled over 3492 miles altogether in a year. White sharks can swim up to 35 mph, but normally cruise at much slower rates. Betsy is the first tagged white shark to be tracked in the Gulf. As far as scientists know, great whites only occasionally visit the Gulf of Mexico, usually preferring cold waters inhabited by large marine mammals. So the ping was an exciting story in itself, but things get even more curious. The next day, a group of divers spotted and captured video of a great white about 80 miles offshore from Sanibel. But it wasn’t the same shark! The great white spotted by divers did not have a tag, which means there were two sharks roaming the same general area over the weekend. Watch for a Sanibel Sea School guest appearance! So the big question: are great whites more common in the Gulf than we thought? Maybe – it could be that they’ve always been here and we just didn’t see them often. The development of new tracking technology and a growing number of divers with cameras could lead to more verifiable sightings. An alternative hypothesis is that the oceans aren’t as healthy as they used to be, so the sharks are expanding their range to search for food. It’s hard to say, but the events of the weekend pose many interesting questions about these powerful and fascinating creatures for scientists to examine in the near future. We’ll be sure to keep our readers posted on the latest research – and please let us know if you hear anything interesting related to this topic!